Bulk tiff files joiner & splitter software is robust Windows utility helps to manipulate TIFF image files. It can easily combine multiple tiff photos either have single frame or multiple frames per file. Tool joins all the frames of multipage tif pictures together and saves at desired location on the disk. This consolidated program can also perform tiff split task in a fashioned manner. ...... The image formats that the program supports as output files are JPG, BMP, PNG, GIF, TIF etc. If users need to delete any specific page or frame from tiff file, TIFF Splitter merger is best solution to extract the desired pages out from photos by deleting frames. 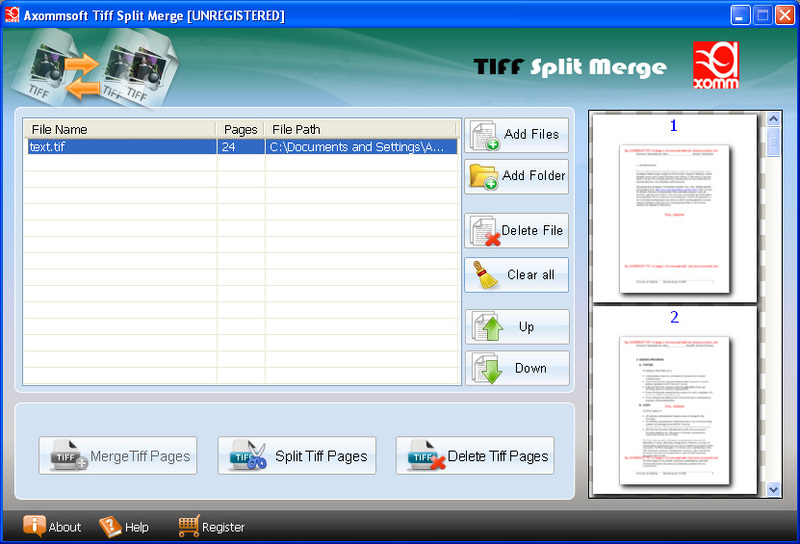 Tiff split merge tool maintains data integrity after split merge delete process. In fact, Program does not require any extra plug-ins or supporting files for proper working. Tiff graphics joiner splitter cutter program is an intuitive and robust utility which helps to divide a multipage tiff files into fraction, one page per file. This program takes any multipage tiff and splits it down into separate pages. Qweas is providing links to Tiff Merger Splitter Cutter 1.2 as a courtesy, and makes no representations regarding Tiff Merger Splitter Cutter or any other applications or any information related thereto. Any questions, complaints or claims regarding this application Tiff Merger Splitter Cutter 1.2 must be directed to the appropriate software vendor. You may click the publisher link of Tiff Merger Splitter Cutter on the top of this page to get more details about the vendor.